The Niagara Independent, October 5, 2018 – Tuesday morning the CBC ran a headline story: “‘Yay!’: How the Canadians won the argument that opened the door to a NAFTA deal” reporting a confident Prime Minister Justin Trudeau saying, “There was [on Saturday] a sense things were falling into place.” In most news reports this week Canadians have been reassured that PM Trudeau and Foreign Affairs Minister Chrystia Freeland (dubbed “the warrior princess”) were victorious in wrestling U.S. President Donald Trump to concede to Canadian terms on an improved NAFTA deal. The President, in his hyperbolic style, called the deal “the single greatest achievement of all time” as he claimed victory for the American worker with a deal that will “pour cash and jobs” into the U.S. There are significant incentives for more American auto production as cars imported from Canada and Mexico will now need 75 percent American content (up from the current 62.5 percent). This will force automakers to source fewer car parts from Germany, Japan, South Korea or China. Mr. Lighthizer stated these changes will result in bringing more car production back to the United States. U.S. got significant provisions to extend to 10 years the intellectual property protections of American pharmaceutical companies selling prescription drugs in Canada. The result is Canadians will pay more for biologic drugs. A new IP provision also impacts Canadian copyright law, which will now need to protect creative works to 70 years after the artist’s death. Behind these headline issues, Americans received these concessions from Canada. American imposed steel and aluminum tariffs are not lifted as part of the deal. There is no opening up of government procurement processes as Bloomberg News reports the “Buy American” rules that block cross-border procurement appear untouched. 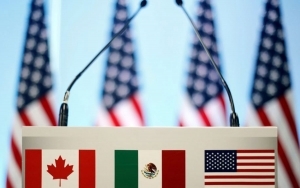 American financial services companies gain better access to Canadian and Mexican markets. The deal does not update the list of professions eligible to work cross-border with special visas – something Canada was seeking for IT professionals looking for easier access to work in the U.S.
What is as remarkable as these details made public in American news sources on Monday is the fact that, on Tuesday trade news had been buried to the back financial pages, and on Wednesday “the single greatest achievement of all time” was nowhere to be found in American media.